Here's something for a knitter to solve: What's an easy scarf to knit that looks nice, isn't a basic rib or garter stitch, but can be easily knit while reading a good book or watching a good mystery show? 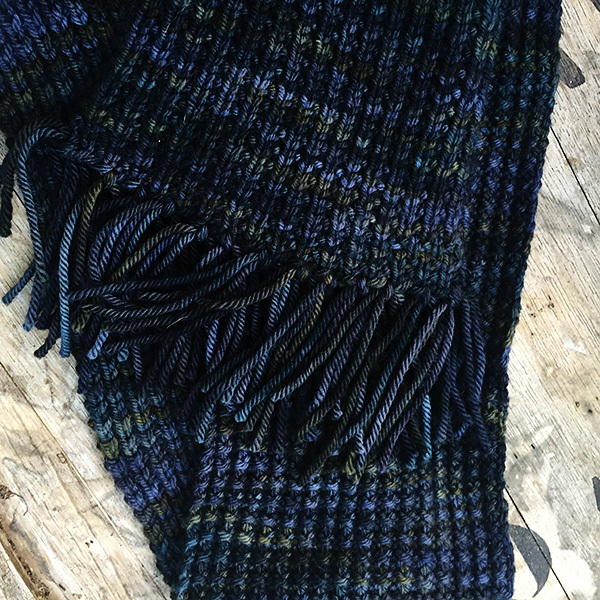 The answer is the Baker Street Scarf! Knit in a lovely yarn that any man (or woman) would want to wear while looking smart around town, the mix of knit and purl on one side and plain knitting on the opposite side give each side of the scarf a cool and unique look. 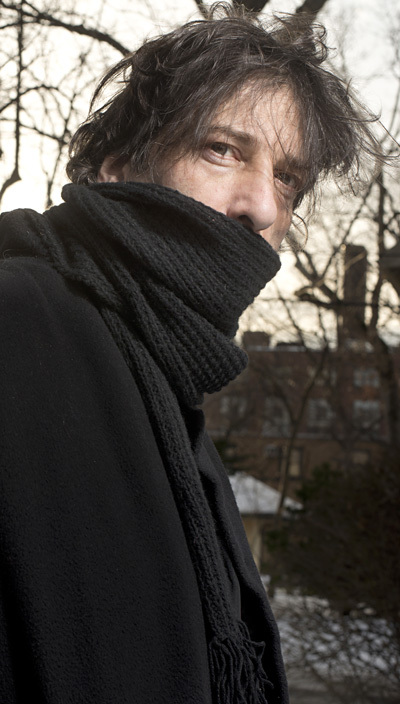 The scarf worn on the BBC version of Sherlock Holmes is in a darker navy or grey color, but since our model is Neil Gaiman, the original had to be in black! Knit it in basic black like Neil's to be mysterious, or in a bright color if standing out in a crowd suits you better! Editor's note: When Tina at Blue Moon Fiber Arts saw the photo at left, she was inspired! She created a lovely colorway just for the Knitty release of this pattern and put it on a lofty, squooshy base of super-fine Merino! 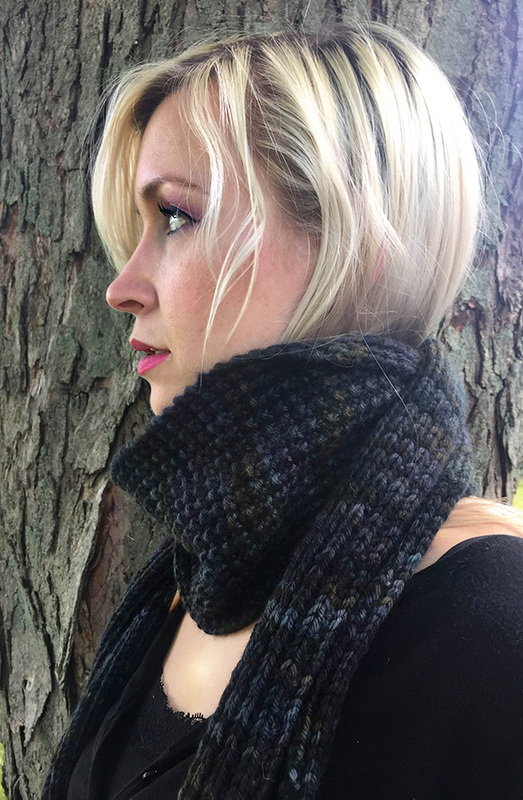 Named after a quote from Neil Gaiman's American Gods, "Say Nevermore" (quotes intentional) evokes the darkness of true black while incorporating hints of color that are the hallmark of the Blue Moon Fiber Arts Raven colorways. You can see it on designer Joan of Dark in the photos below. Step 1: Decide how long you want your fringe to be. If you want 6" fringe, you need to find something that is about 6" to wrap yarn around. Or you can cut a piece of cardboard into a square for your desired size. Step 2: Wrap your yarn around your square to your desired thickness. If you want thin fringe, make about 10 wraps; for thicker fringe do 20. Step 3: Cut the yarn at one end. You now have one fringe bundle. Step 4: Repeat steps 2 & 3 until you have the desired number of fringe bundles. Step 5: With the right side of your project facing up, insert your crochet hook into the first stitch where you desire your fringe to go. Step 6: Take one bundle, and hook the center onto crochet hook. Pull through and line up the bundle until both sides are even. Step 7: Tie with a square knot. Step 8: Fringe everything! Fringe the place mats, the scarves, the dog! Step 9: Face fringe intervention from friends. Row 1 (RS): (K1, p1) across. Repeat Rows 1-2 until scarf measures 72 ins, or desired length, ending with a RS row. To block, handwash carefully. Weave in ends. Apply fringe to both ends of scarf. Joan of Dark is sometimes called Toni Carr. But not very often. Her passion for knitting started when she asked her grandmother to show her how, and instantly regretted all the time in her life spent not knitting. 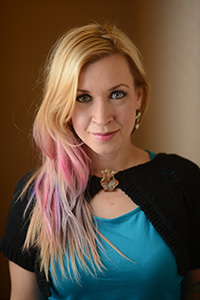 Her first book, Knockdown Knits, was all about roller derby and knitting. The second book, Knits for Nerds, is all about nerdy knitting. So one could guess that Joan is a roller derby loving knitting nerd. This would be correct. She is also a rescuer of animals, and surrounds herself with not only a very loving and tolerant husband, but a miniature horse named Starkey, Pigwidgeon (Widget) the parrot, a very weird dog named Sassy Burrito, Willie the craziest corgi mutt ever and a cat named Rori. Future plans may include a female duck named Howard, but the husband's tolerance may only stretch so far. When not knitting, skating, performing aerial silks, or running though muddy obstacle course races, you may find she is working in her coffee shop, Strange Brew, playing the guitar or the bass, or occasionally having too many glasses of wine and entertaining her twitter followers with her tipsy ramblings (search #joanofdrunk). Pattern © Joan of Dark. 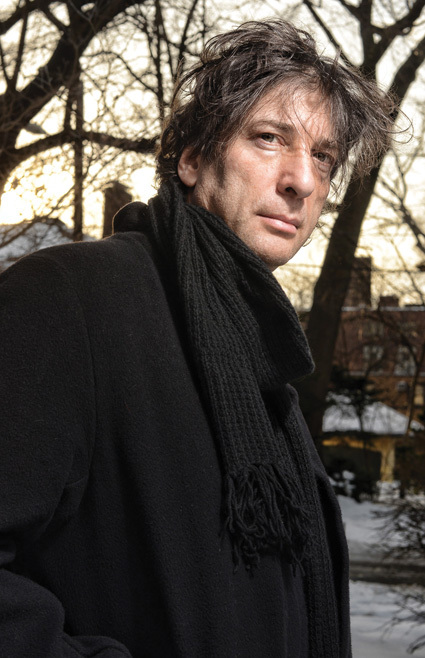 Images of Mr. Gaiman and headshot © 2015 Kyle Cassidy.